Lord Rayleigh discovered acoustic whispering-gallery waves travelling in the air around the cylindrical walls beneath the dome of St. Paul's Cathedral more than 100 years ago. When you whisper, the sound waves 'creep' round the gallery, hugging the walls. Calculated whispering-gallery modes in St Paul's. Left: 55 Hz. Red and blue show higher and lower pressures, and the distortions in the grid lines show the air particle displacements. Right: 53 Hz with grid lines only. Each particle moves in an elliptical trajectory. The number m refers to the number of waves around the circle, and the number n refers to the number of nodes in the radial direction (excluding the centre). Here is a simulation of whispering-gallery waves in an enclosed cylinder of air with the same diameter (33.7 m) as the gallery of St Paul's Cathedral. The travelling sound waves go one way round. At fixed pitch we refer to these patterns as modes. We can experimentally visualize moving sound waves trapped in a whispering gallery using our surface wave imaging apparatus. Left: cross section of the Gol Gumbaz mausoleum — a famous whispering gallery. Right: optical image of our sample — microscopic discs of copper. For this purpose we use discs of copper 40 μm in diameter (1 μm=10-6 m), embedded in a layer of silica, all on top of a slab of crystalline silicon. We generate surface acoustic waves near a point on the rim, and then scan probe-light pulses over the sample to make an animation. Surface acoustic waves on a microscopic copper disc. A 60 μm×60 μm region. A novel laser intensity modulation technique reveals the whispering-gallery modes. 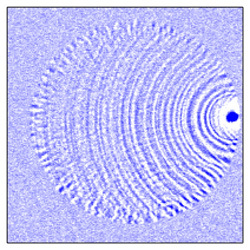 Whispering-gallery mode in a microscopic copper disc at 760 MHz: standing waves. The waves travel in both directions round the disc, causing the wave pattern to flash on and off. This is a snapshot of the whispering-gallery mode intensity rendered in 3D. We were also able to estimate the lifetime of the waves to be around 0.25 μs, which means that the sound goes round the disc about 7 times before dying away. In St Paul's the sound goes round about 4 times. We have also visualized whispering-gallery waves going round a copper disc with a microscopic slot machined near its edge. In the following image and animation one can detect a secondary set of ripples emanating from a defect at about the 5 o'clock position. 175-μm-diameter copper disc with a defect. To animate in the time domain, click the image (2200 kb movie). The next step should be to investigate complicated geometries such as two coupled discs, chains of discs, chaotic cavities or phononic crystal resonators. For articles, see 'Gallery of whispers,' Physics World, vol. 25, Feb. 2012, p. 31 and 'Acoustic whispering-gallery modes generated and dynamically imaged using ultrashort light pulses,' T. Tachizaki, O. Matsuda, A. A. Maznev and O. B. Wright, Phys. Rev. B 81, 165434, 2010.